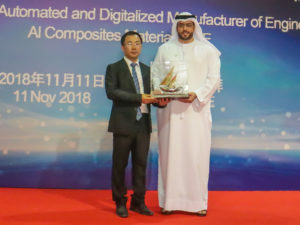 China XD, one of China’s leading specialty chemical companies and one of the top 500 non-stated owned enterprises has opened a new facility under its subsidiary – Al Composites Materials FZE in JAFZA. The company is involved in the development, manufacture and sale of polymer composite materials for automotive applications worldwide. The opening marks a new phase in Jafza’s evolution as the destination of choice for international high-tech industries in the UAE and across the region. Products developed and sold by China XD include 3-D printable filament; 3-D printable powder; bio-based composite materials, including biomass composites; petroleum-based long-chain nylon alloys and high-end engineering. The new facility was inaugurated by Ahmed Al Haddad, Chief Operating Officer, Jafza, in the presence of senior officials from both sides. China XD was founded in 1985 and is a pioneer of polymer composite materials in China. It has been a Jafza customer since 2014 when it established Al Composites Materials FZE. The new plant will include 45 fully customised and automated production lines and 11,250 metric tons of annual capacity by 2019. Products are used in the exteriors and interiors of 31 automobile brands manufactured in China, including Audi, Mercedes Benz, BMW, Toyota, Buick, Chevrolet, Mazda, Volvo, Ford, Citroen, VW Passat, Golf, Jetta.